Taco, a pit-bull mix at the Camden County Animal Shelter, poses for a photo during his walk on Wednesday. 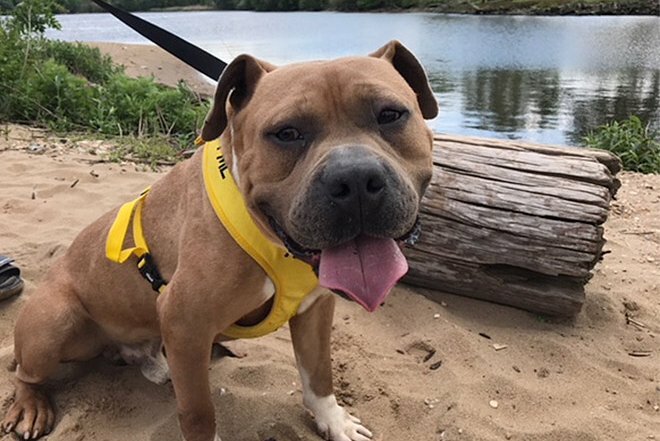 "He’s a big-headed ball of love and deserves an amazing home," said Samantha Lorup, who joined with her friend Adrianna Evelyn to spend a couple of hours in the outdoors with the shelter dog. Friends Samantha Lorup and Adrianna Evelyn each have a dog at home, but they were first in line Wednesday morning at the Camden County Animal Shelter for the new “Rent-A-Dog” program. They had their reasons, as have the many who have checked out a pooch for one to three hours at a time, a boon to the animals, the shelter and the patrons. Lorup, 19, of Westville, has a goldendoodle – a golden retriever/poodle mix – with aggression issues, which make walks a problem. Evelyn, 21, of West Deptford, has a Chihuahua, its tiny legs not the best for long walks. And so, they were there at the no-kill county-run shelter in Gloucester Township, trying on a few shelter dogs for size before taking one for a spin. The innovative program launched in late April. The majority – maybe 70 percent – of the available dogs are some sort of pitbulls. Julia Sliban, 20, a Williamstown resident and shelter employee, said the breed mostly get overlooked by prospective adopters out of fear. Their massive muscled jaws can do damage, but overall, pits which are socialized correctly are “sweet and smart,” she said. Some of the small breeds, such as Evelyn’s Chihuahua, are actually more inclined to be biters. Samantha Lorup of Westville and Adrianna Evelyn of West Deptford each have a dog at home, but they were checking out Taco, a pit-bull mix, on Wednesday morning at the Camden County Animal Shelter. Shelter employee Tim Land escorts Taco to their car. “This was an amazing experience and I can’t wait to do it again next week,“ Lorup said. About 60 percent of the shelter’s population comes from the city of Camden, rounded up by animal control and cops. But all dogs are observed, evaluated and socialized before they are adopted, fostered or rented, explained Mike Bricker, 31, operations manager at the shelter. The rental dogs are among the most social, which explains why the young women fell for Taco, a three-year-old pit-type with a head the size of a melon and a soft spot for anyone willing to make even a small fuss over him. Right behind him, an older pit-type with a greying muzzle, went out the door for a walk with Anna Walker, 32, of Mullica Hill, and Emmanuel Caplan 30, of Williamstown. 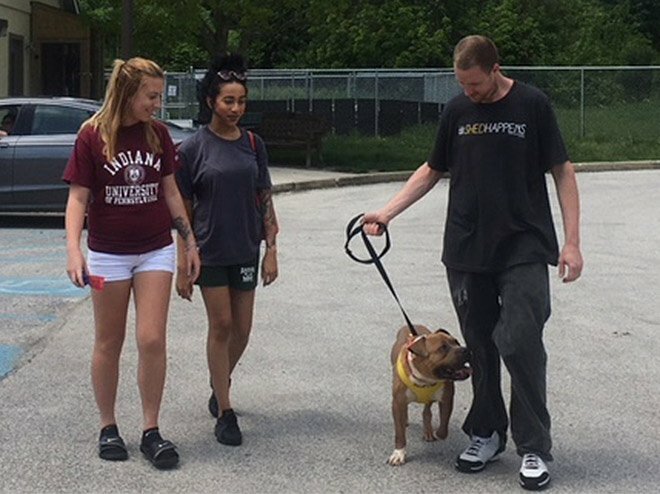 Walker, a former shelter worker, takes out rental dogs as a way to give back to the facility. 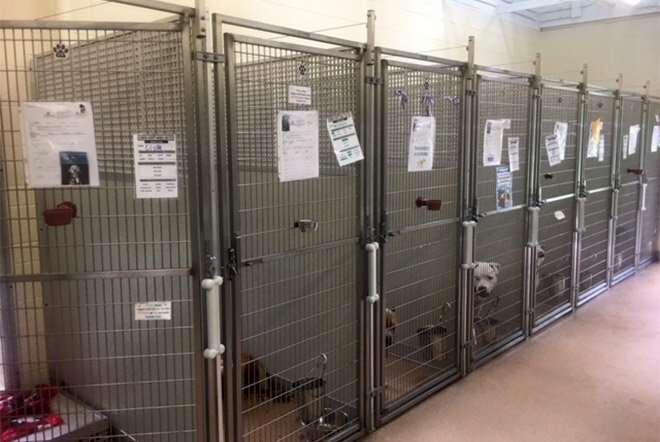 The rental dogs are kept in the kennel run at the Camden County Animal Shelter. Dogs participating in the program are noted with a sheet on the kennel door. Bricker said the program has succeeded in permanently placing five dogs in about a month, though just the exercise and socialization has provided a huge benefit. The genesis for the program came from a no-kill conference he attended in Austin. And while the title implies there is a rental fee, there’s not, though most folks drop money into the donation jar. To check out a dog, you must be 18 or older, provide a driver’s license, fill out a brief questionnaire, sign an agreement and go through a quick handling session. Dogs are spayed or neutered, microchipped, and up-to-date on all shots. The shelter is at 125 County House Road in Blackwood. For details, check here, or call Sara Sharp at (856) 401-1300, extension 102. “This was an amazing experience and I can’t wait to do it again next week," said Lorup after their jaunt. “Taco is a fantastic dog. He gives amazing kisses and loves vanilla ice cream. He’s a big-headed ball of love and deserves an amazing home." Evelyn said she hopes the Rent-A-Dog program lead to permanent homes for Taco and other dogs. "I will continue to use this program and promote it with the hopes of people seeing how awesome these dogs are regardless of how old they are, where they came from, or what breed they are,” she said.